Hoping that this is something I am missing rather than the feature being absent. Justification, it is only doing 'Word Spacing' justification instead of 'Character Spacing' justification. If this is not available, it is essential that this feature is added. Having 'Character Spacing Justification' is a key feature of publishing class software, and this concept literally goes back to physical letter placement on printing presses. This is also not new as it was available in very early typesetting equipment of the 70s/80s and the early days of DTP publishing software like PageMaker. It is still incredibly important to have this feature in 2018. This type of justification is the main reason I usually reach for Publisher software, as I don't want my brochures to look they were composed in a word-processor with cheap/simple 'Word Spacing Justification'. 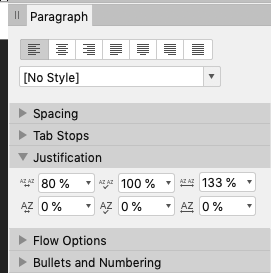 So far, I am really enjoying Affinity Publisher and appreciate the attention to detail and control given to typography, including Ligatures and Stylistic Sets along with the consistency of the UX and concepts consistent with Affinity Photo & Design. I realize this is beta, which is why I want to voice my request that Affinity Publisher be offered through the Windows Store, just like Photo and Designer are currently. It is extremely helpful for myself and other users I have recommended the software. The Store version is much easier to install, uninstall, migrate in addition to the added security and ability to run on Windows 10 S Mode. I had tried the Windows Affinity Photo beta when it was first available, and it had dropped out of mind until I came across it again in the Windows Store when it was being promoted by Microsoft, which I purchased immediately and shared the store link with friends and family. A Windows Store version of Publisher is truly important. Welcome to the Serif Affinity Forums, Martin. Having ﻿'Character Spacing Justification' is a key feature of publishing class software, and this concept literally goes back to physical letter placement on printing presses. This is also not new as it was available in very early typesetting equipment of the 70s/80s and the early days of DTP publishing software like PageMaker. It is still incredibly important to have this feature in 2018. It sounds to me as though you may be referring to tracking. There is a control for this in the 'Positioning and Transform' section in the Character panel. Thank you, it is tracking I was looking for, and now I feel silly having missed it. As for the MS Store, it is just a request, I don't expect everyone to buy it through the store. For example - it is easy to get a refund. There is no difference between who handles the 'registration' - as Affinity accepts MS Store and Affinity purchases equally - as you may notice, I'm here posting in the forums - and I have nothing purchased directly from Affinity. The Windows Store is essentially equivalent to the Apple Store, and I don't see iPad or iPhone users complaining about the Apple Store as they understand the model and how it works. However, the same experience creates 'regret' for a Windows Store user because they don't realize it is a similar model with the same benefits? I think people are a bit confused, and I can't fix that for them. However, I do know what works best for myself, IT deployment, and it is IMPORTANT to offer a Windows Store version, especially as a lot of users and students leave their device in the Windows 10 S Mode and would be UNABLE TO USE Affinity Publisher if it is not available in the store. I should mention, I teach OS Theory & Engineering, UI & UX Design, and development classes for several languages. Watching people 'fear' the Windows Store isn't new, but always surprising when people have full understanding of the Apple and Google Play Stores and somehow try to make the Windows Store into a boogie man because it is just like the Apple and Google stores. If Caveat emptor was mentioned to every iPad user buying Affinity through the Apple Store, it might seem silly, just as it is with the Windows Store. Thank you for the answer I was seeking. I had a facepalm moment when I read 'tracking' from the first response and saw the options in your response. I also feel a bit silly now. T﻿hank﻿ you, it is tra﻿cking I was looking for, and no﻿w I feel silly having miss﻿ed it. You’re welcome, Martin. It’s very easy to miss these things. As﻿ for the MS Store, it is just a request, I don't expect everyone to buy it through the store. Understood. I fully expect that there will be a Microsoft Store version of Affinity Publisher. For exam﻿ple - it is easy to get a refund. There is no difference between who handles the 'registration' - as Affinity accepts MS Store and Affinity purchases equally - as you may not﻿ice,﻿ I'm here posting in the forums - and I have nothing purchased directly from Affinity. The user in question clearly didn’t find it easy to get a refund! The problem wasn’t to do with registration, it was to do with the user’s inability to get the software onto his son’s machine without involving his Microsoft account. Installation of the Affinity Store requires nothing more that a copy of the installer and an email/product-key pair. With regard to there being “no need” to backup the installer, it’s a very big download! For some users, it might be quite expensive to download it all over again. I look back at my response and realize I shouldn't write posts after waking from a nap. I jumped a bit too much into the case for Windows Store. So now I feel I should add some clarity to this subject. The problem isn't the Store, or a limitation, its biggest problem is user misconceptions. Regarding refunds, the automated refund process is still in beta, so it would have required a call to Microsoft. This is a bit more work, but not hard/impossible. However, the reason the user wanted a refund was based on bad information, as they could easily install the product on their son's computer. They just need to add their account and sign into their son's computer and install the software. There are also two ways to do this. 2) The best method would be to simply create a user login for their account on their son's computer, use PC's login screen and install the software. The son could then use the software from their screen, and never touch the parent's account nor gain access to their account. Then the registration/activation process is all automated through the Microsoft Account and not through Affinity or a 3rd party purchase construct. Issues with 3rd party activation/registration systems are common as they are all different and can be unforgiving or cumbersome. This week, I installed a new SSD and with it a new Windows installation on this PC. All my software purchased/obtained through the Windows Store (400+ Titles) all installed seamlessly, including the Windows Store versions of Affinity Photo and Designer. This isn't just a case for the 'Microsoft Store', but all Stores and repositories of software that use consistent purchase and licensing models. One of the biggest reasons for Apple's iPhone/iPad success, is the store and making software installation painless and simple and just a couple of taps on the screen. If iPhone users had to use non-consistent web sites to find and download and activate and register software, the appeal of the iPhone would be greatly diminished. I truly thank you for the response and hope I brought a bit more clarity to my earlier response.